Mount Lawrence Grassi is immediately south of Canmore. 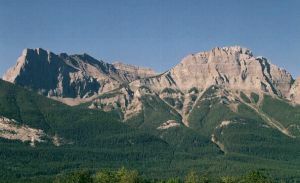 It is a continuation of the same ridgeline as Mount Rundle, and is separated from Mount Rundle by Whiteman's Gap. Name Notes: The peak was originally referred to as Chinaman Peak in Putnam and Bowes. However it was renamed to Lawrence Grassi and the old name moved to the northwest peak.